Aviatrix allows you to configure LDAP authentication for users logging into the Controller. At the login prompt for the Controller, the user will enter their username and LDAP/AD password to authenticate. 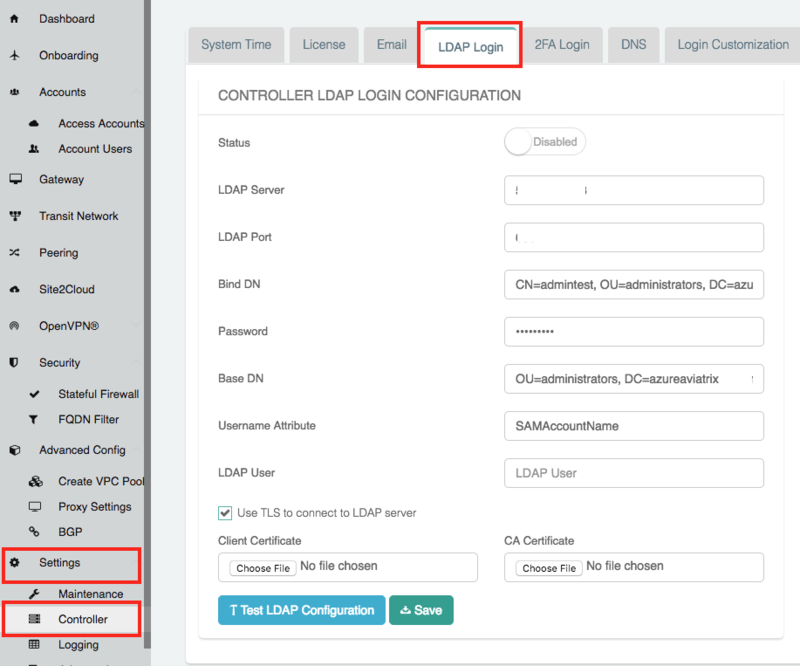 Status Select Enabled to enable LDAP login on the Controller. LDAP Server Enter the IP or hostname of the LDAP / AD server. LDAP Port UDP Port 389 is the standard port for both encrypted LDAP (using STARTTLS) and non- encrypted connections. Bind DN DN of the user that the Controller will use to authenticate with the LDAP server to handle user authentication. Password The password of the Bind DN user. Base DN Starting point in the directory for searching for matching usernames. Username Attribute User attribute name for username to match. LDAP User This field is only used when clicking on the Test LDAP Configuration button. It will use this value to search and respond if it was able to connect and find the user. Use TLS to connect to LDAP server When checked, STARTTLS is used to connect with the LDAP server. NOTE: LDAP Over SSL is not supported (port 636). You’d have to provide a FQDN for the LDAP server if TLS is turned on. Client Certificate Only visible if Use TLS to connect ... is checked. CA Certificate Only visible if Use TLS to connect ... is checked. LDAP authentication requires local user accounts be created on the Controller. The username configured in the Account Users must match the username in LDAP/AD. Once enabled, local user accounts will no longer be active. That is, if there is a user created in the Controller that does not match a user in LDAP, they will no longer be able to login to the Controller.